Miss me? Sorry for the delay last week. This has been a busy time at work and I have been taking it home with me at night to do instead of this. Issue #21 is from Oct/Nov 1980 and it is off to a good start with some cool late 70s/early 80s wizard art. A lone star focused through gems reveals a fighter in battle. If it were redone today the gem would be d20 shaped. We have an ad for Ariel games which in a bit of neat synchronicity features a game reviewed earlier today by James at Grognardia, The Mystic Wood. This and four other pages of ads follow. The editorial is another "Ripped from todays blog roll" on whether or not the Vancian magic system is outdated. Interesting really. 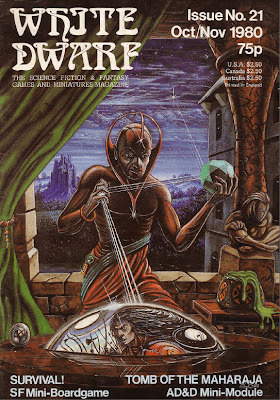 This is 1980, not 2012 and the D&DNext playtest discussion. Though maybe they should read this editorial. Not that the offered solution, the power point system in RuneQuest, is much more modern today, but it bears thinking about. There is also a note about their production artist, Robert Owens, who was killed in a crash. Andrew Finch gives us a new D&D class based on The Chronicle of Thomas Covenant. "Lore of the Land" features the Lore Lords. They are an uber spell casting class that can combine their spell casting levels to cast more powerful spells and increasing the fighting ability of others. Something like a hyper-bard. Also detailed are Rhadmaerl, or a new type of magic user based on the Lore of Stone and the Hirebrand or Lillianrill, magic uses based on the Lore of Wood. And finally the Bloodgurd, a type of fighter. If you are a fan of the novels then these might be fine, but as character classes they look a little over powered, with the exception of the Bloodguard. Roger E. Moore gives us a bit on Merchants. Including what they do and an NPC class for them. Very much an example of the early days when every profession had to be detailed as a class. Open Box review Azhanti High Lightning, one of the classic classics of Travleler. Andy Slack gives it 8/10, James gives it a little bit more detail. Roger Sandell reviews Intruder from Task Force Games, giving it a 6/10. He states it is a "good idea, but needs improvement". John Lambshed reviews another Task Force Games entry, Valkenburg Castle. This one fares better at 8/10. Letters deals with important issues like alignment and why does a lantern burn for 24 hours but the same flask of oil thrown lasts only a round. Up nest is another complete mini-game Survival by Bob McWilliams. Seems simple and quick to play. Treasure chest is upping their game this issue with a bunch (15) new spells. Fiend Factory gets a huge makeover this issue. For starters the layout is better and the monsters are all grouped by a theme. In this case wilderness monsters for characters of 5th to 7th level. The font used to write the monsters' names is now a plain one, not the stylized art font unique to every monster. Monstermarks are still included. The monsters themselves also seem to have been taking up a notch in terms of design. The jokey monsters are gone, replaced with real threats. This issue gives us The Brothers of the Pine (undead full of magical pine sap), Chthon (a living rock), Enslaver (a small pool of mercury that controls others), Micemen (the results of Brownie/Orc crossbreeding), Dragon Warriors (created from the teeth of dragons), Grey Sqaargs (a race of evil automata) and a Cyclops. Starbase, the Traveller feature, continues with a mini "situation" for Traveller. We would call these an Encounter today. S. Hartley presents the Tomb of the Maharaja, an AD&D mini-module for 6-10 3rd and 4th level characters. It is a nice little dungeon crawl that could be completed in one night. 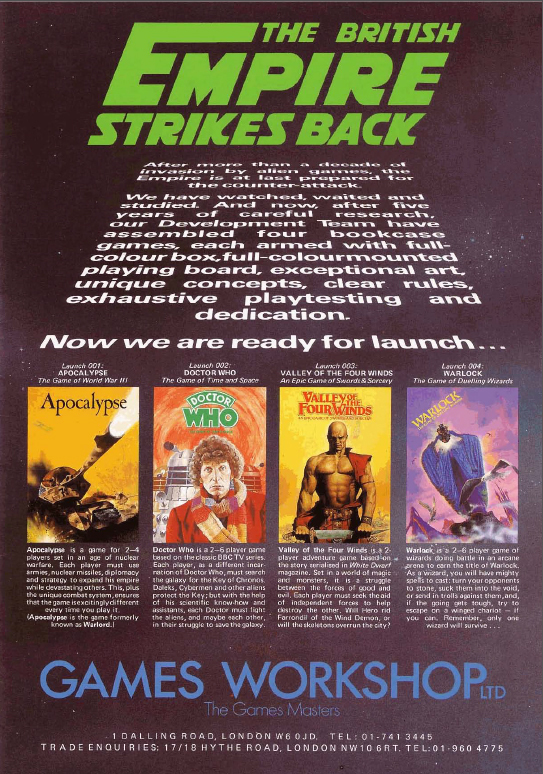 Up next are some ads, including this one from Games Workshop that really got my attention. Remember when I said at the start of this that anything British was automatically cool in my teenaged mind. 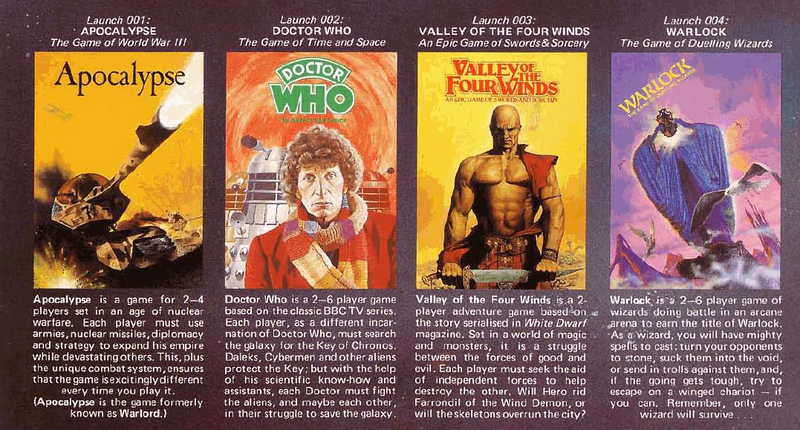 Here is a better scan of the Doctor Who board game that I mentioned last time. With issues 20 and 21 we see a shift in WD to a more mature gaming magazine. The jokey monsters and classes are going away and focus on other games, like Traveller, is keeping the focus more of serious gaming material. Let's see if this trend continues. A newer EN World one that reviews 10 issues at a time to get a better perspective on the overall trends. Grognardia takes us back to the future every Tuesday with his Ares retrospectives. Land of Nod does Dragon by Dragon every Sunday. Wow, now there's a blast from the past. Is that magazine worth much more today than 32 years ago? No idea. I know that most of the old Dragons still sell close to cover price. But I would guess the WDs do a bit better. Personally I find something new to use each time I go through them.